RefEDGE PRO™ was used this past weekend at a US Youth Soccer ODP tournament for Maine, Rhode Island and New Hampshire 2003 Girls Teams. The event took place in Portland, Maine. The turnout by parents and spectators was very good and the level of play was fast and competitive. On hand were regional ODP staff watching the eight 40 minute matches. Special thanks to the referees for the comments on RefEDGE PRO™ and the GRIPCAGE™. The consensus was that the Stand-and-Spray formula is a leap forward from having to bend and be so close to the ground like other formulas. The GRIPCAGE™ holster was a winner and was worn locked in the horizontal position after some experimenting by one ref. The other ref kept it vertical the entire time. The players clearly enjoyed the “wow” factor of using the spray in a youth game. The tournament was a big success for all involved. RefEDGE, LLC, a Maine company, releases new Stand-and-Spray™ vanishing referee spray. 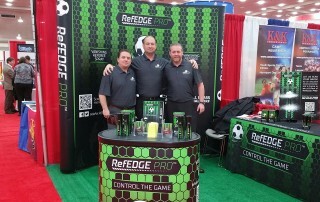 Launched in January at the NSCAA show, after 2 years of development, RefEDGE PRO™ is sure to be a product that changes the industry. RefEDGE PRO™ is the first in the world with the patent-pending Stand-and-Spray™ delivery method that allows the referee to stand upright while marking the field. No longer does the referee have to bend over and take their eyes off the game. RefEDGE PRO™ features the perfect size can between capacity and weight; large bulky cans are a thing of the past. Without a doubt, RefEDGE has hit the mark with their brand as well; the can, the 6-pack box and the holster are all well done and sharp. Unique to the industry also, the Stand-and-Spray™ formula allows the referee to vary the dwell time for the foam on the field… Want it to last a minute – spray it fast; want it to last longer – spray it slow to let it pile up more. RefEDGE™ made the spray for the referee to CONTROL THE GAME™ and CONTROL THE LINE™ the way they want. Have you ever run out of spray in the middle of a line? Worry no more… on top of the already impressive upgrade features, the RefEDGE PRO™ design now gives you warning when you are about to run out of spray. When there are about 2-4 sprays left in the can, the spray will get “airy”. 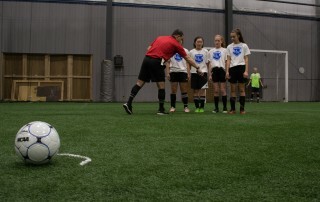 The referee can still get a few more sprays out of the can by holding closer to the ground and won’t run out mid-line. See the airy warning, grab another can. Multi-game usage and capacity is also impressive for such a small can. The label says it will last 2+ games but real world tests yield up to (16) small arcs for the ball and (16) 5-6 foot lines for the wall – of course your mileage may vary. If major upgrades to the spray weren’t enough, RefEDGE created their own holster with multiple patent-pending features. Called the GRIPCAGE™, the holster is equally impressive and comes in 4 colors to match each referee jersey. With the referee in mind, the thoughtful design incorporates the ability to wear the holster locked vertically, locked horizontally (right or left handed) as well as free-swinging. Have you been frustrated in the past trying to get the can back in the holster – this is no longer an issue. The GRIPCAGE™ design is very forgiving and allows the can to be inserted by sliding in from the top OR snapping in directly sideward OR (my favorite) “stab” the bottom of the can in midway first and snap the top in by tilting inward – so fast, so easy – finally! RefEDGE really hit the mark with needed improvements for a needed product and with prices of $9.99 for the can and $16.99 for their green holster, it’s a great value. Proudly, the spray is Made in the USA as well. Check out their website at www.refedge.com – it is a well done site and they currently have some nice promotions running. Check your favorite reseller to see if they carry RefEDGE products. The owners of RefEDGE, LLC file patents to protect delivery method and holster features. In anticipation of their public launch and after much top secret R&D, patents have been filed with the United States Patent and Trademark Office seeking protections in the United States and up to 140+ other countries. One patent seeks protection on the owners proprietary stand and spray delivery method which is unique to the world and allows the user (referee) to stand upright when spraying the formula. This delivery method combines proprietary formula, propellant, valve and actuator to allow the spray to be used at a much greater distance than all others on the market while still maintaining a tidy, usable marking line on the field. In addition to the delivery method filing, another filing seeks protection for features unique to their can holster which allow it multi-function use. Various features of the holster allow it to be easily locked vertically as well as horizontally as well as free swinging. In addition to the mounting flexibility, the holster’s shape allows flexibility in how the can is inserted allowing for easy top entry by sliding it in from the top OR side entry by snapping the can in directly sideward while parallel to the holster OR tilting it in by “stabbing” the bottom of the can in the middle of the holster and tilting the top inward (the fastest way). RefEDGE, LLC is a Maine company and makers of vanishing referee spray among other products.